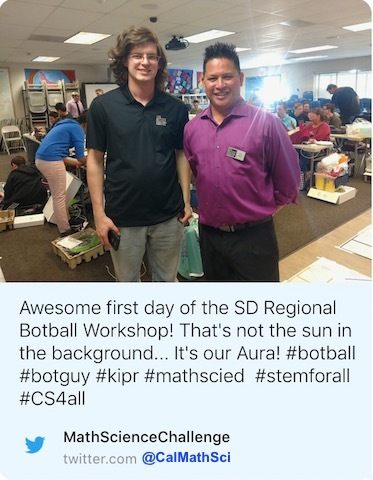 The CA Math & Science Challenge! is a nonprofit dedicated to providing curriculum, teacher training, & ongoing professional development for K-8 Schools in underserved communities who wish to create Early Learning Advantage™ robotics-based sTEm programs. Let’s Get Our Kids in the Game! Support the Math & Science CHALLENGE! Kimiko and Sage, age six, learn about DISTANCE and DIRECTION by playing robot darts. Vivi, Lilly, and Meredith, ages six, six, and seven, learn about CIRCLES and DEGREES by trial and error. The Math & Science CHALLENGE! Step 3: Get them World-class Coaching in a Special Math & Science Learning Environment: Active Learning Zone™. The CA Math & Science Challenge STEM DEVELOPMENT PROGRAM begins at age 5 with a K-3 robot-based* Introduction to Programming, Problem-solving, and Applied Mathematics. Children don’t know they are doing math & science, they fall in love with “their” robot, learn its language, and start to teach it to solve puzzles on the Project Challenge-Tree. In this Early Learning Advantage™ program…. Children program the computers, not the other way around! The MSC STEM DEVELOPMENT program gives children a lifelong head start and an experience that fights the current reigning paradigm of passive, click & play “edutainment” software, by starting children off with four years of meaningful, enjoyable, hands-on interaction with computers, mathematical concepts, and information technology. With your help and this Early Learning Advantage™ approach, we can produce American math and science athletes who can compete anywhere in the world, surviving—and thriving— in the unpredictable Information Age economy. or funding a Robotics Team? • Contact us! San Diego Botball Challenge • Ready to Go!